I am so excited that I finally get to share with you a DIY Christmas gift! I had really wanted to start sharing my gift series with you sooner, but it seems like life always has other plans. For the first Christmas gift post, I thought I would share one of my favorite ones to make. It is a cool gift for a teacher. This is something that I have given to my kids' teachers in the past and they always love it! I have family members that are teachers, and their usual gift they receive is something like hand lotion, soaps, or a coffee mug. 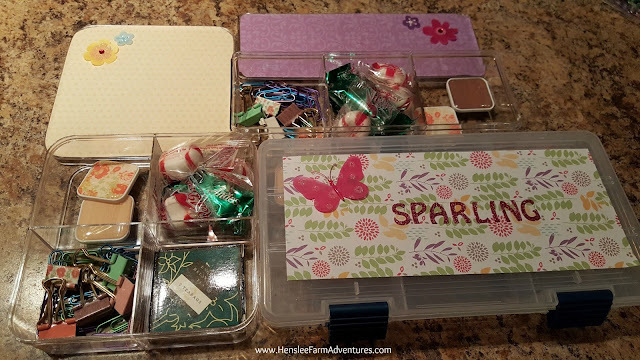 Instead of giving them the usual items, give them this wonderful little goodies box that can be personalized in a way that can include items that teachers need in their everyday use at school, as well as include some nice treats. So without further ado, here is how I made these. You'll want to start with the box. In the past I have purchased small tackle boxes from Wal-Mart that are around $3.00 per box. They are great because you can customize the size of the compartments inside. 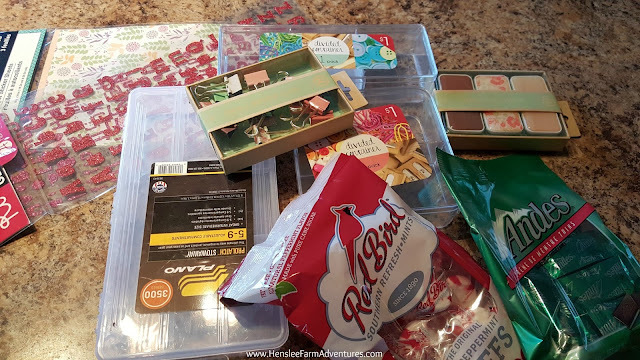 The boxes are sturdy, and they can continue to use them for small desk supplies. 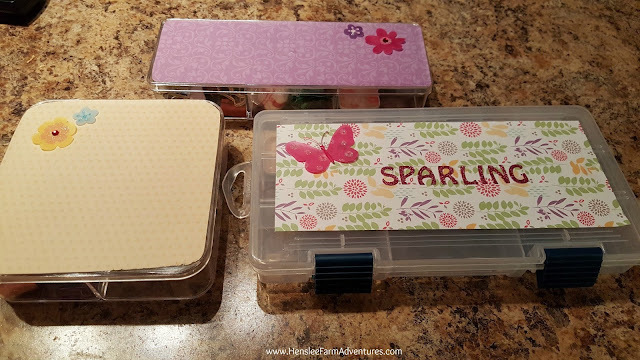 Then one day while I was at Target and I found these great plastic boxes for only $1.00! I loved these and picked up a couple, one rectangular, and one square. Of course you can't change the size of the compartments inside, but for the price, these are perfect! The magnets and the pretty alligator clips I got from Wal-Mart, the rest of the supplies I purchased from Dollar Tree. I loved the fact that our Dollar Tree had some pretty paper that I could use to decorate the lid of the box and the best part is that it had an adhesive backing! How easy! Before I had always used scrapbook paper and a glue runner. Adhesive paper. If you look real close, you can see where I scored it to put on top of a box. The first thing I did was to make a mark, or score the paper to the size of the top of the box I was using. 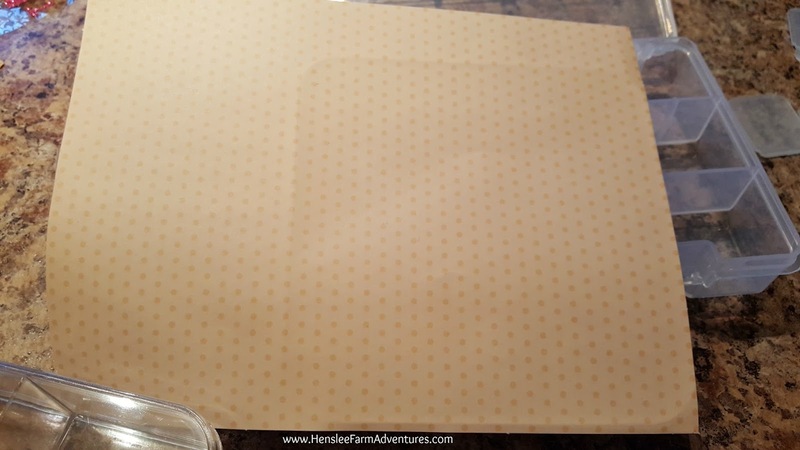 You can see in the picture above the crease of where I need to cut the paper to size. You could also be more exact and measure, and I even thought about getting out my rotary cutter, but to be honest, I was a little lazy. After I cut the paper to size, I peeled off the backing and stuck it onto the lid of the box. Here is where I had some trouble. I found out that once it sticks, it sticks! There is no re-positioning this paper, so you have to be very careful. Once I got the paper on the box lid, I then decorated it with stickers and glitter letters. This is where to get the kids involved so they can customize their own teacher's box. I usually put the teacher's name on the lid as well as some stickers. For this project, I used what I already had on hand. 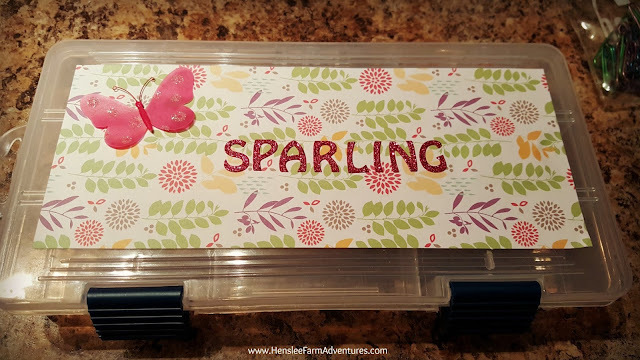 It just so happens that I had leftover glitter letter stickers and some 3-D stickers that I had purchased from the Dollar Tree for the Back to School Backpack Craft. Here are all three boxes, decorated. Next, comes the fun part of putting the goodies inside. 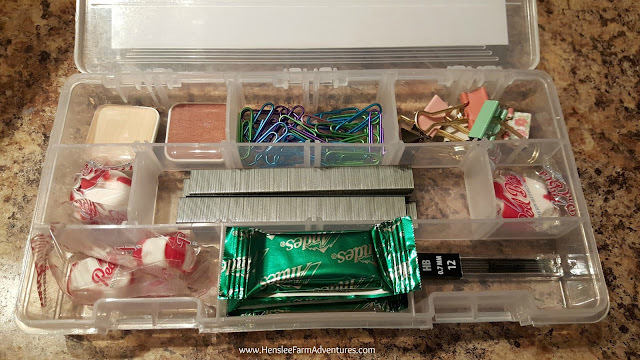 I used some items that I already had on hand, paperclips, staples, and pencil lead, and then added in the decorative magnets, alligator clips, and of course the candy! You can see that in the square box, there were four compartments. Besides the school supplies and candy, I decided to add in some tea. For the rectangular box, there were only three compartments so I wasn't able to add as much. The one good thing about these compartments though is that they are deep, so I can double up on items and fit more things in. As you can see the bigger box has more compartments and they are adjustable as well. I have several different things that a teacher may need. You can customize this however you like. If you know there is something special that the teacher needs or likes to use, then you can throw that in there as well. I do plan on adding a few more items before I give these to our teachers this year. One thing to remember when you are making teacher gifts, don't forget the special teachers! That would include music, art, gym, computer, and whatever else your school might have. They too deserve a great Christmas gift! I hope you all enjoyed the first in a series of DIY Christmas gifts. Let me know in the comments below what you think of this idea.